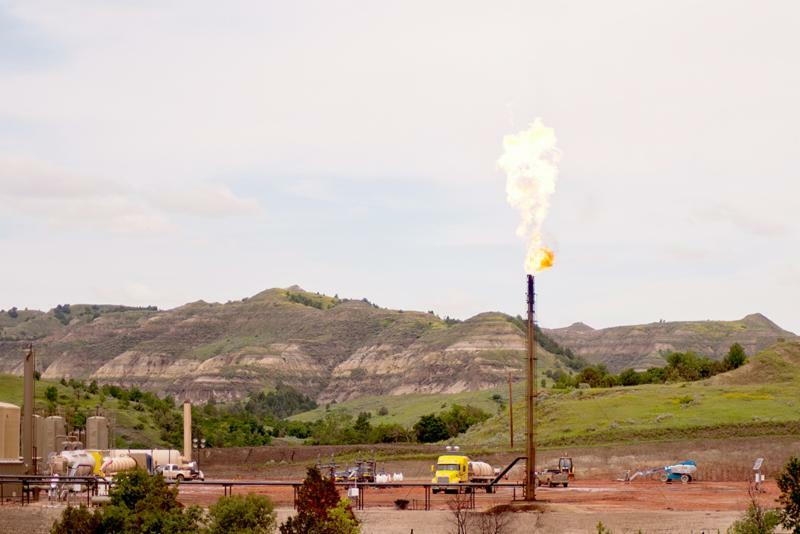 Efforts to reduce excessive natural gas flaring on the Fort Berthold Reservation have been temporarily halted because state officials say the Bureau of Indian Affairs has put a hold on all pipeline permitting requests on tribal land. Lynn Helms, Director of the North Dakota Department of Mineral Resources, told members of the state Industrial Commission this week that the BIA plans to require midstream gathering companies to post a larger bond. But until the amount of that bond is determined, Helms said BIA is not approving any right-of-way agreements. He said companies operating on Ft. Berthold are understandably concerned. Wintry weather typically produces power outages, and when that happens the electrical equipment needed to keep oil flowing also stops. So it’s no surprise that North Dakota oil production dropped slightly in the month of December. Statistics released this week by the Department of Mineral Resources show average daily production dipped to 1,181,319 barrels/day, down about 15,000 bbl from November’s production rate. The state’s natural gas output also dropped slightly in December, averaging 2.08 billion cubic feet per day. DMR Director Lynn Helms said he expects January’s production numbers will also be down, but the state remains on track to set a new all-time oil production record later this year. Helms said higher prices and changes in federal tax policy will keep production on the upswing. North Dakota’s highest monthly oil output occurred in December 2014 when production averaged 1,227,483 bbls day. Click here to see DMR’s Director’s Cut. More than 700 people attended the first-ever Main Street ND Summit in Bismarck this week, and much of the conversation was about quality of life issues that will make North Dakota communities attractive so more people will want to live and work in the state. Communities in western North Dakota have been devoting a lot of attention to attracting workforce to keep the oil industry humming. Governor Doug Burgum echoed that theme during the conference, pointing out the importance of finding more people to work in the oilfields. Burgum said workforce recruitment starts with the younger generation. He said communities need to focus on young people who live here now. During the conference Burgum unveiled the Main Street Community Dashboard, an online tool developed by the Department of Commerce and other agencies to provide community leaders with information that can be used to help grow healthy, vibrant, financially solvent communities. The dashboard includes community profile information and state, county and city financial information. 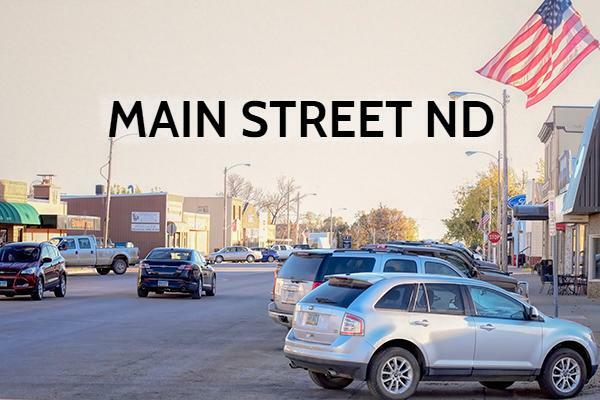 Click here to view the MainStreet ND Resources page. Burgum made his comments during an interview with Scott Hennen on the radio program What's On Your Mind. Click here to download a podcast of the full interview. 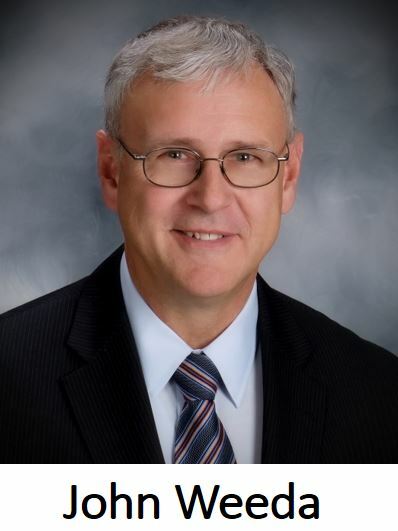 The ND Industrial Commission this week named John Weeda as the new director of the North Dakota Transmission Authority. 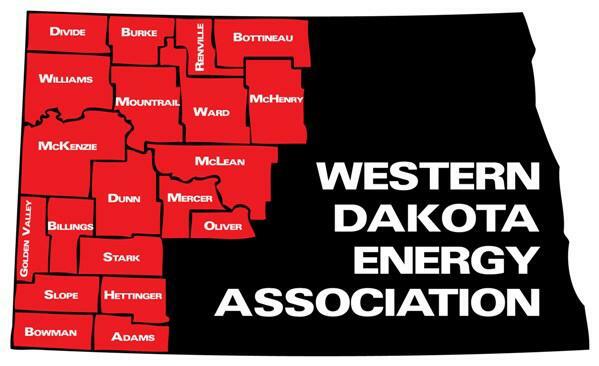 The authority was created by the state legislature to facilitate development of transmission facilities to move North Dakota energy. But in his new role, Weeda will be expected to focus most of his time on regional electricity markets, according to Jason Bohrer, President of the Lignite Energy Council. Bohrer, who was involved in the hiring process, said Weeda has “a good understanding of market dynamics as they have changed, especially over the past five years,” and also has a thorough understanding of the lignite industry. Weeda worked for Great River Energy for 41 years, and retired last year as director of plant operations. State officials have expressed growing concern in recent years that North Dakota’s coal-based generating units have been under-utilized because regional transmission organizations prioritize the use of wind resources ahead of coal to meet demands of the electric grid. “We’re inappropriately pricing baseload, and when we do that it wears out those assets and raises long-term costs,” said Gov. Doug Burgum, who chairs the NDIC. Bohrer said because the electric industry is changing, there may be a need to amend the law which outlines responsibilities of the transmission authority. Although statewide numbers dropped slightly, oil production in McKenzie County increased between November and December. McKenzie County Economic Development Coordinator Daniel Stenberg attributes the uptick to the fact that winter weather has not been as bad as it could have been, and that allowed for continued growth in production. Stenberg said businesses in the county could use more workers, the lack of which is limiting growth. A job fair scheduled April 26 may help ease the situation. The county unemployment rate for December was 2.1 percent, compared to 3.7 percent in December 2016. 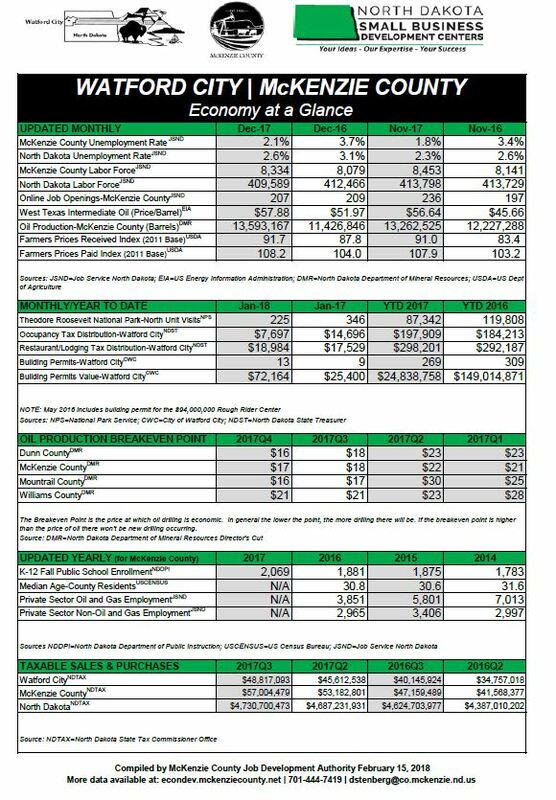 See the McKenzie County Economy at a Glance here . McKenzie County school enrollment could double to 3,000 students in the next 10 years. McKenzie County's 2017-2018 enrollment report is here. Click here to read an op-ed about school enrollment by Neal Shipman, editor of the McKenzie County Farmer. 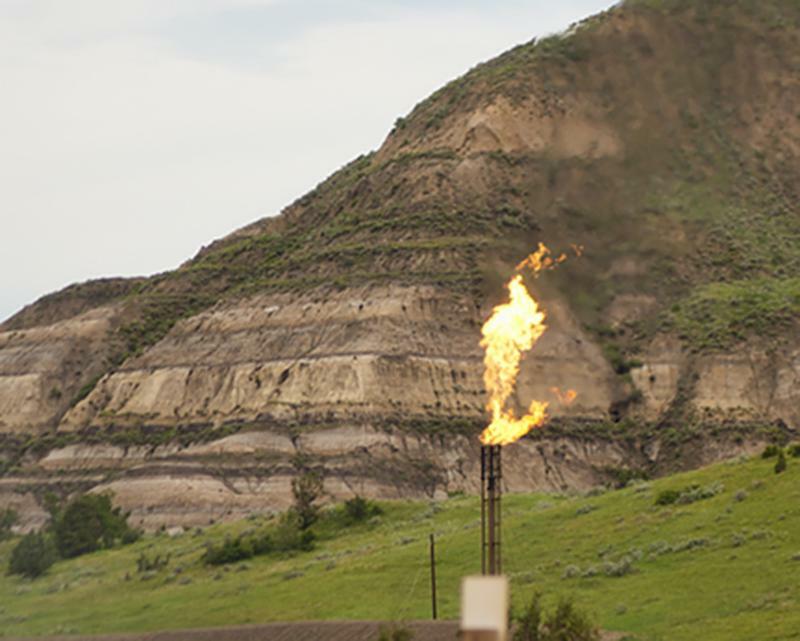 The Bureau of Land Management is proposing to replace an Obama-era venting and flaring rule with requirements similar to those that were in force prior to adoption of the 2016 rule. The BLM said the proposal would bring regulations in line with Trump administration priorities on energy development, job creation and reduced compliance costs, while also working more closely with existing state regulatory efforts. “North Dakota has clearly demonstrated that state-led regulations can deliver good environmental stewardship without imposing unnecessary costs,” said Senator John Hoeven. Read the BLM announcement here. The Lignite Energy Council is inviting teachers in North Dakota and surrounding states to sign up for the LEC’s annual Education Seminar. The seminar will be held June 11-14 at Bismarck State College. Kay LaCoe, the LEC’s Director of Membership Marketing, said the event is expected to attract more than 100 teachers from throughout the region, and they will receive valuable graduate credits upon completion. Click here to listen to LaCoe’s comments. Participants receive credit from the University of North Dakota, North Dakota State University, or Minot State University. The seminar will provide teachers with educational materials they need to teach their students how lignite is mined and used to produce electricity for consumers in the Upper Midwest. One day of the seminar is devoted to a tour of mining operations, mine reclamation sites and coal conversion facilities. North Dakota’s newly revamped student loan forgiveness program for teachers may offer up to four years’ worth of debt relief, which school districts can use to recruit or retain teachers. Teachers who benefit from the program could have from $12,000 to $26,000 in student loan debt forgiven over four years, depending on their position and location, according to Kirsten Baesler, Superintendent of the state Department of Public Instruction. The 2017 Legislature made major changes to the teacher loan forgiveness program. Applications now must come from school districts, rather than individual teachers. Chase Iron Eyes wants court assistance to fight DAPL charges -- A.P. The coldest February, and the coldest month ever, in North Dakota history occurred in 1936. The average statewide temperature for the month was a bone-chilling 14.1°F below zero! The state's warmest February was 1954, with a statewide average temperature of 29.6°F.